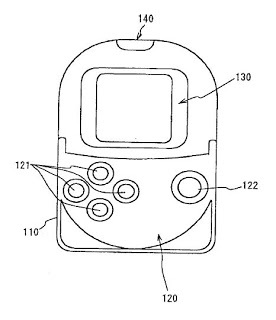 The ‘989 patent provides a portable electronic device which allows a player to connect to his virtual pet. During the connection, a number of conversation scripts are downloaded which allows the virtual pet to communicate with the player. The user can teach the pet new words and have the pet react to the commands these words provide. The invention also includes a dictionary function which allows the pet to speak and understand several words. Pets can understand and playback whole sentences if the player takes the time to teach them how. This invention looks to provide a very entertaining toy for a child by giving the player complete control over the pet’s learning. A portable electronic device is selectively connected to a master. Durring conection, a plurality of conversation scripts and associated dictionay are downloaded to provide a video game comprising a virtual pet, which game is capable of being executed independently from the master. The virtual pet is able to provide an interactive conversation with a user by the use of the script programs and a dictionary. In addition, the user is able to teach the virtual pet new words. Attributes of the words are modified when the user teaches the pet the words, and their intended meaning, and durring later conversations. The attributes are modified based upon the responses of a user to questions asked by the pet. The user responds by selection of one of a number of possible replies. 1. A comnunuication apparatus between a user and an entertainment apparatus, the entertainment apparatus having at least a microprocessor, memory, display controller and means for inputting user commands, said communication apparatus comprising: an electronic dictionary comprising words and associated status information related specifically to said words; an alteration element to modify the status information of one or more words based on user interaction with said entertainment apparatus; a sentence generator creating a sentence including said one or more words and based on said modified electronic dictionary word status information associated with said one or more words and adapted to a situation between a user and said entertainment apparatus, and a sentence output element for outputting a sentence generated by the sentence generator to display as a message to a user.